Hey there, all! First off, I would like to apologize because as it turns out, the post that I had planned to put up this morning was simply not working so I decided to put it on the backburner and scrap together this Empties post instead. Therefore, bear with me since this is my first improvisation at such a short notice and I apologize again that this switch-a-roo has caused a hullabaloo. 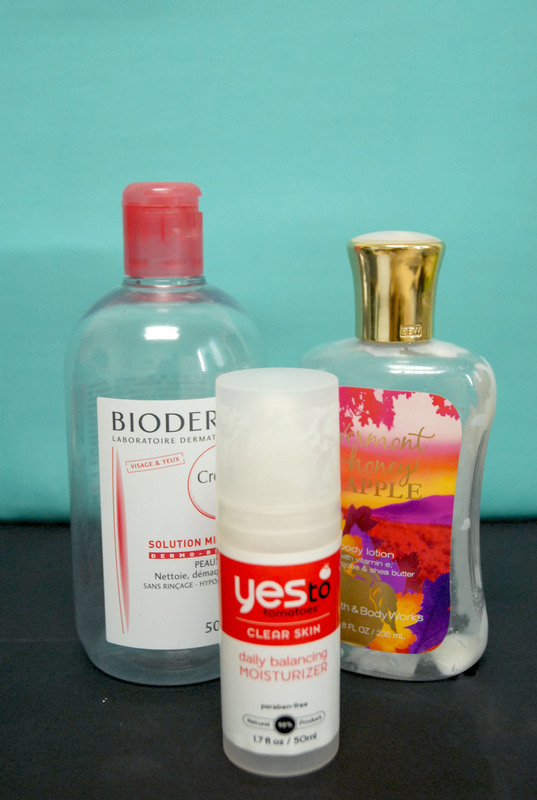 Anyhow, if you are not aware of what an “Empties” post entails, it involves people of the beauty community saving their trash (aka finished up products or “empties”) in order to give a thorough review upon completion of the product. A handful will be saved until there are enough to make an entire post out of. You see, when it comes to beauty products, throughout the course of their lifetime opinions on them can change. Mascaras that were once adored can become clumpy towards the end of its lifespan or a lip color that was hated at first and tucked away and rediscovered to become an everyday staple. 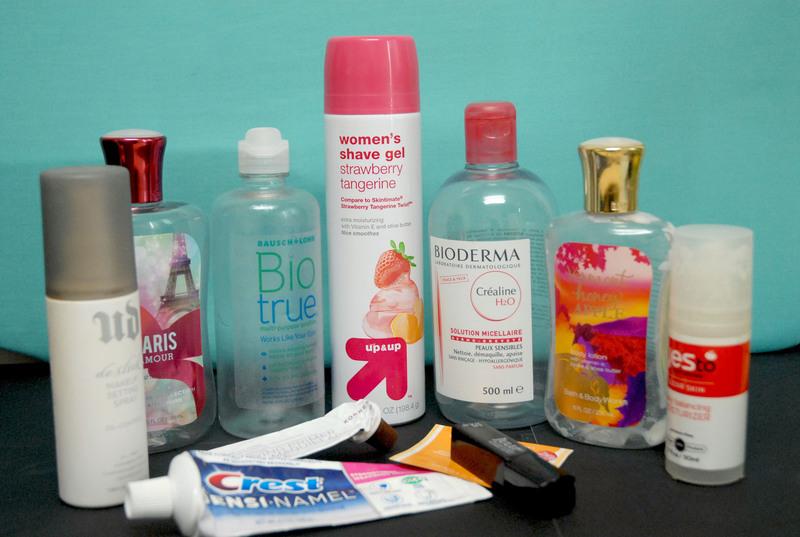 Both beauty products and beauty people can be fickle, thus the invention of the “Empties” review in order to give proper insight on products. Well, now that that’s settled, let’s delve into my own trash, shall we? 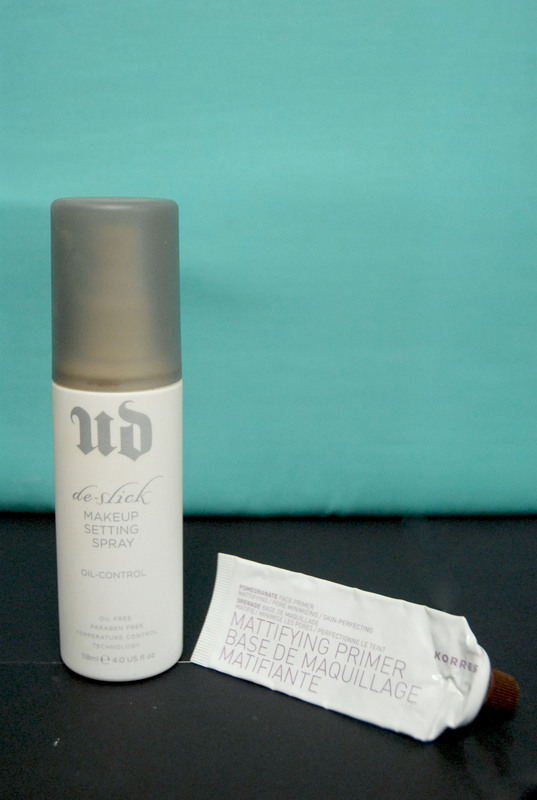 Urban Decay Deslick Setting Spray– I mentioned this product in my 2014 Favorites post, so it’s safe to say this was well loved. Likes: The product has a nice, fine mist that distributes well over the face. 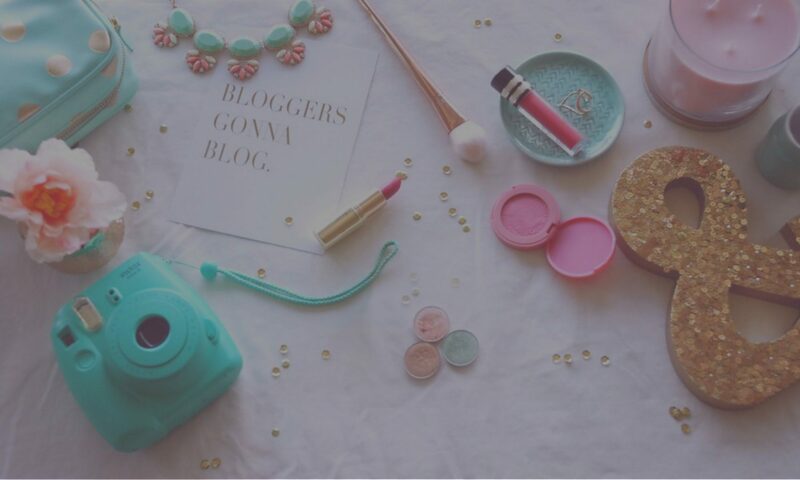 It greatly improves the longevity of a full face of makeup and helps control oil in the skin. The product leaves the skin feeling refreshed and locks makeup into place. The bottle is also a good amount. I used this pretty much daily and it lasted me almost the whole year. Dislikes: The price is more than I would prefer for a bottle of special water, but I love it nonetheless. Also, towards the end of the bottle, the mist was not as fine as it was towards the beginning. Conclusion: I have already repurchased this product and will most likely continue to keep repurchasing unless I find something better. Korres Pomegranate Mattifying Primer– Also mentioned in my 2014 Favorites, this is another staple in my collection. Likes: Perfect everyday primer that mattifies the skin by controlling oil without being overly drying. It has more natural ingredients as opposed to many silicone based primers, so it is especially kind to your skin and prevents further breakouts from clogged pores. Dislikes: As most good products, doesn’t come with an easy price tag but this product has gotten me through an entire year using it on a mostly daily basis. This primer is not designed for photography makeup or super long wear events, as it is more of a day-to-day product, so be wary. Conclusion: I adore this for everyday use and have already repurchased it. It is just enough to get me through a school day and is gentle on the skin. I’ve tried a fair share of primers, and this will also remain my favorite for everyday wear unless I find something else. Bioderma– I mentioned this in one of my first ever posts Five Products for Finals Week, and I honestly don’t know where I would be without this product in my skincare routine. Likes: The original beloved micellar water, this was my very first bottle that some friends who went to Europe after high school brought back for me. (I’m sad to see it go, and almost want to keep it.) Since then, I’ve been hooked on French skincare. This all-in-one product removes makeup, cleanses, tones, and leaves the skin feeling balanced and refreshed and works well with most skin types. I find with many products like this, after using it the skin can feel dried out, but Bioderma never has! It works especially well after a cleanser or makeup wipe to remove those last stubborn bits of makeup, on long nights when you just need a quick-fix, or as a refresher after waxing or a facemask when classic cleansing would be too harsh on the skin. Dislikes: Although it has gotten better in the past few years, since this is a French product it can be fairly difficult to get your hands on, and also at a cost. Also, despite being a multi-use product, it will not leave your skin 100% clean on it’s own, and is unfortunately not a cure all. It is more of a multi-use product in the sense that it can be used in a variety of situations to remedy a multitude of things, not a catch-all product that will do all the work in half the time. Conclusion: I have a stockpile of Bioderma tucked away because I love it so much. It is handy to have around and its benefits supplement the little gaps in my skincare routine that need a specific product. Likes: This scent was beautiful for fall; light and fruity with just enough musk and spice to be reminiscent of autumn but to not be so overwhelmingly fragrant of pumpkin spice. I bought this bottle the fall before last and tucked it away at the end of the season, only to bring it back once I got back to school. The product has a long shelf life and does its job of hydrating skin. Conclusion: I used to be obsessed with these lotions that I bought many of my own and had been gifted many that have accumulated and now I’ve been trying to get through and finish up because they don’t compare anymore to the Body Shop body butters. Although the scents are delightful, they just don’t provide the intense hydration I have come to prefer. Likes: This was my go to facial moisturizer for a year or two. The Yes to Tomatoes line is specifically designed for acne prone skin like my mine and I have found that this moisturizer does the trick of adding hydration to the face without being over oily. A little does go a long way however, and I only had to replace this two or three times a year. The product also works well both day and night and is not too heavy on the skin. Conclusion: I have not repurchased this product, yet, but I think I will go back to it after finishing a few things up. Right now, since it is the drier winter months, I’ve been gravitating towards facial oils instead, however, once the warmer weather comes around, I’d love to have another bottle of this stuff. Likes: I used to adore this scent in high school, it is a mixture of floral and fruity with just a hint of warmth; I used to think I was so sophisticated for wearing it and I was gifted and purchased several sets of this fragrance in lotion, shower gel, and body mist form. This is my last from the stockpile, and I will say it is probably my favorite product out of that trio of gifts. It does its job and smell delightful, although I am rather sick of the scent now. Once again, it also lasts a long while, having to be replaced every few months or so. Dislikes: This product almost lasted too long, as I tired of the scent midway through using it up. Also, the quality was once again outshined by the fragrance, however it does do a better job than the lotion, albeit an unextraordinary job. To be honest, it was kind of “just whatever”. Conclusion: I’m not in any hurry to repurchase this specific product, and for the most part I find that shower gel is just shower gel with different scents. Likes: Since this is generic brand, it is rather inexpensive and does its duty of preventing cuts and razor burn while shaving, however, nothing extraordinary. Dislikes: It is not my favorite scent and can be particularly overwhelming while in a contained area (aka a shower). It is so overly artificially fruity smelling that when I was first using it (because I could not find any of the shave gel I normally use) I gagged a few times. Conclusion: In a pinch, I could bear using this, however it is not my preference. Likes: To be honest, I was drawn in by the packaging of this product; the box is a light green with simple typeface and features. As a design major, I found the minimal box design refreshing among the cluttered and overbearingly dark and graphic packages of other solutions. However, I have come to like this particular contact solution for its gentleness on the eyes. Some other solutions that I have used before sometimes “shock” my eyes when I put my lenses on in the morning, giving a subtle stinging effect. On the contrary, this solution is much kinder to my eyes. Dislikes: It is a few more dollars than the average contact solution. Conclusion: I have repurchased this, however I can use other solutions in a bind, this is simply a personal preference. Likes: I tended to lean more toward whitening toothpastes, as my teeth have a habit of yellowing in-between whitening treatments, however the whitening ingredients in those toothpastes started to make my teeth sensitive. When it came time to find a new toothpaste, I discovered that this one aided in sensitivity while still maintaining that “Crest White Smile”. Dislikes: The taste was not the mint flavor I was used to, but I adapted to it quickly. Also, the toothpaste I used before had an attached cap rather than a screw on like this one, which I prefer because I lost the cap a few times, let’s be honest. 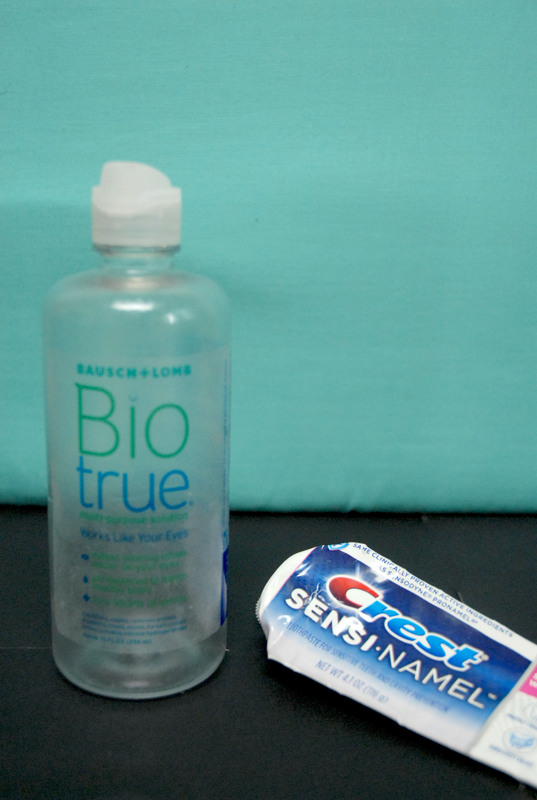 Conclusion: I would repurchase this product but have not yet, as I am finishing up another toothpaste I already have. Likes: I made a resolution to try and use up more samples, as I have accumulated a small box full of them. This sample was good enough for two uses. I enjoyed the scent, a strong orangey citrus and it did not break out my skin. Dislike: Not so much of a dislike, but since this is a sample I don’t think I used this product enough to conclude if it made a significant difference in my skin. Conclusion: There is a deluxe sample in a set at Sephora that I would be willing to consider trying after using this, however I am in no rush to get my hands on it. Likes: I discovered this product as a 100 point perk at Sephora and found the full size in a rather well priced Holiday set during Black Friday 2013, not long after. Liking the sample so far, I picked up the set and have been hooked on this stuff ever since. This top coat is supposed to act as an at-home gel polish alternative by sealing any normal polish with a gel finish. It cures quickly and does not need a special light, although you can dry it under a normal lamp for 30 seconds if you wish. It does indeed leave the nails with a gel effect and tends to smooth out any minor imperfections. It also has a nice shelf life and I went a year using this as my main top coat. Dislikes: Yet again, a pricey product. 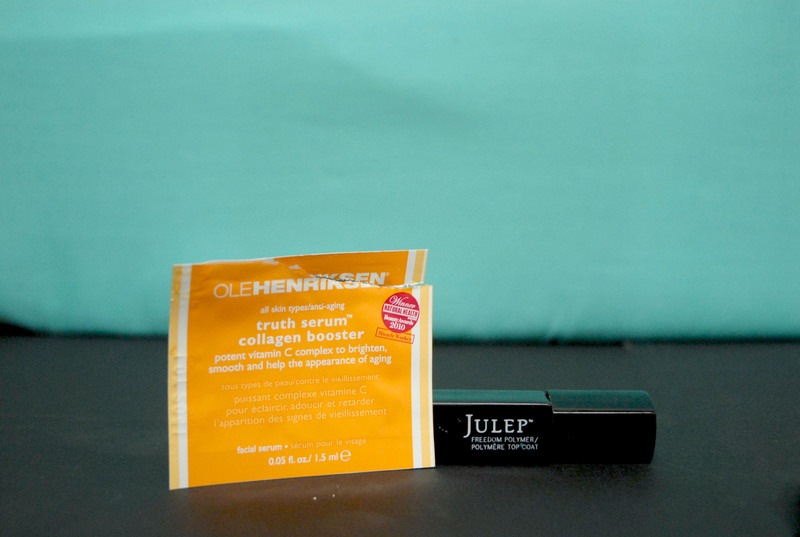 However, it can sometimes be found discounted as an add-on item when you order from the Julep website. Also, although this gives a gel finish, it does not last nearly as long as a traditional salon gel manicure. I have also come to find that the lasting time mostly relies on the color polish itself, and this product does not necessarily prolong the wear more than a day or two. Towards the end of using this product, I also found that it began to dry out and get whiskery. Conclusion: I have already repurchased two of these for $10 as an add on from the Julep website. Although it’s not the same as a professional manicure, it’s enough of an-at home alternative that I keep reusing it. Well then, that concludes my Empties for now and I apologize again for this post going up late. I will say, however, that I do plan on adding more content throughout the week when I can, so stay tuned for that and expect your regularly scheduled programming to continue next week! Until then, thank you for your patience!